And here's a quick peek at the mag! Waitrose Weekend magazine. Contributors: Heston, Delia, Neill. May I just say, it is a profound honour and the realisation of a lifelong ambition to be sharing page space in a publication with a personal hero of mine: Gregg off Masterchef. And if that doesn't keep you busy, remember you can always visit the Mo-Bot High Facebook Page and while away the hours thinking up ridiculous entries for my Giant Robot Competition! 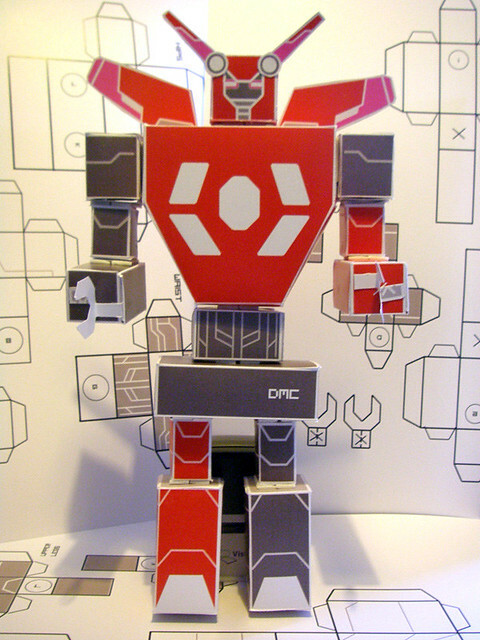 COMPETITION: Win the giant robot of your choice! 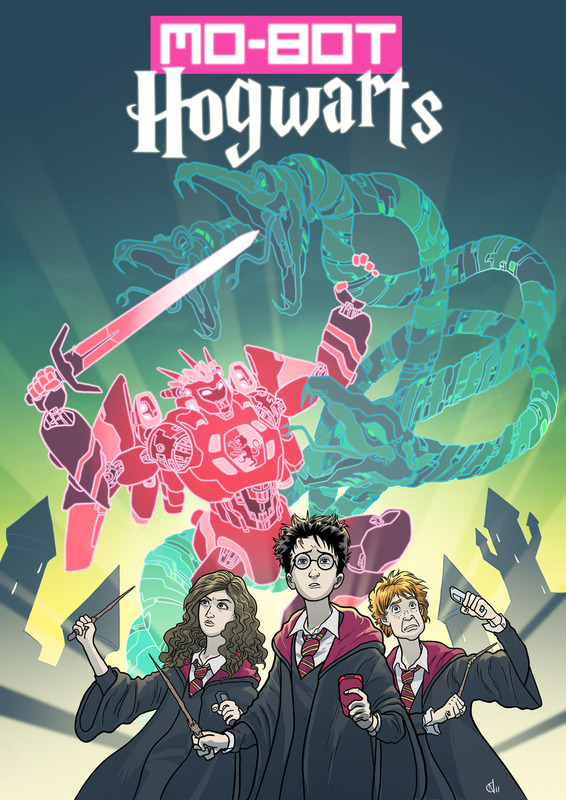 I very much enjoyed drawing Giant Robot Judge Dredd and Giant Robot Harry Potter this week, so I thought it would be fun to do another in this little sort-of-series. But who to turn into a giant robot next? Yes, I thought it might be fun to turn it into a little competition, and give you YES YOU the chance to win a piece of original, custom artwork depicting a Mo-Botized version of the comics / movie / pop culture character of your choice. 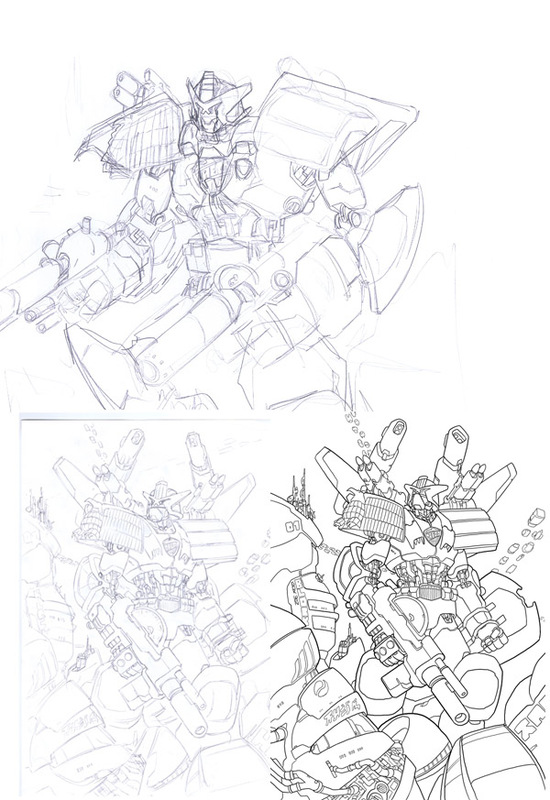 The winner will get an A3 full-colour poster print of the finished piece, as well as the ORIGINAL pencil sketch / whatever scribbles and roughs I do to get started. TO ENTER: all you have to do is go 'Like' the Mo-Bot High Facebook Page, then say who you would like a giant robot version of. THAT IS IT. Closing date of January 15th, 2012, at which point I will use a combination of random number generation and deciding which one I most want to draw to pick a winner. (i.e. if the suggestion 'Batman' wins, and there are 20 entries saying 'Batman', I will pick the winning entry using a random number generator). PS I'm not saying 'Batman' is going to win, that was just an example. Although I DO totally want to draw Giant Robot Batman. Go enter! It will be FUN. Mo-Bot Week rolls on tomorrow with the funnest and - by far - most ridiculous entry yet! use more giant robots. Big Version of this pic right here. 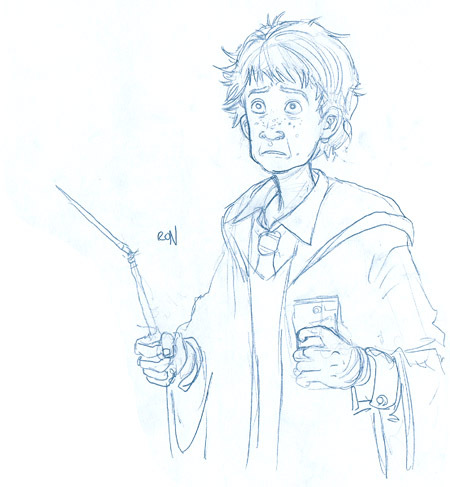 The SECRET ORIGIN of today's entry in Mo-Bot Week*: so aaaages ago I made a Funny Joke on twitter, announcing my delight at the news that I'd landed the assignment of producing graphic novel adaptations of all seven Harry Potter novels... but that I would of course be making some changes. This was essentially just an excuse for me to make up lots of silly titles: Harry Potter and the Unusually Large Baby, Harry Potter and the Drunk Jellyfish, that sort of thing. Anyway, comics writer, journalist and tweeter par excellence Chris Sims chimed in with "Harry Potter and The Hell With It, They All Have Giant Robots Now." And lo, my mind was blown. I'm only sorry it's taken me this long to actually draw it. Look, I even made 'character designs' for this one. 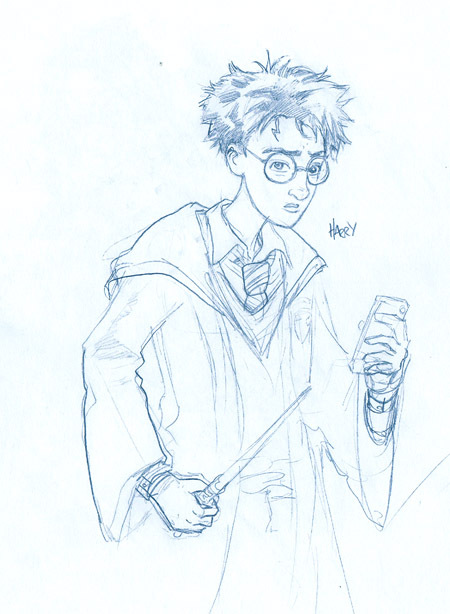 In the unlikely event that they do ever license the Potter books for comics versions, I can only imagine the creative team would be like Neil Gaiman and Dave Gibbons, or generally the famousest and most expensive creators imaginable. 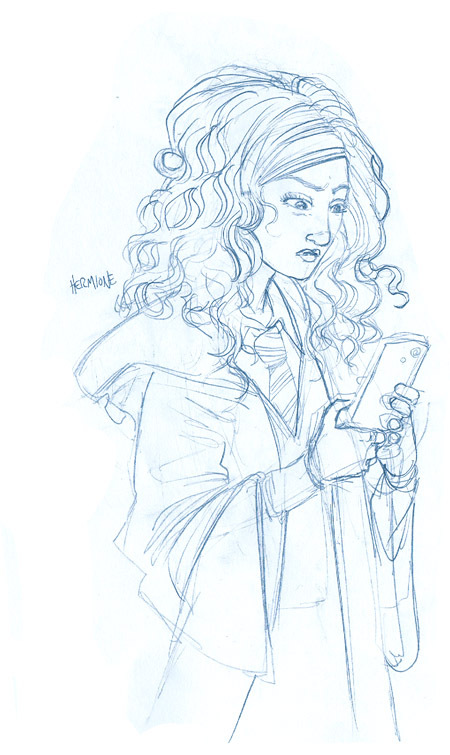 But I'd just like to say: I WOULD DRAW THE HECK OUT OF THAT $#!£. Holla at me, Bloomsbury. 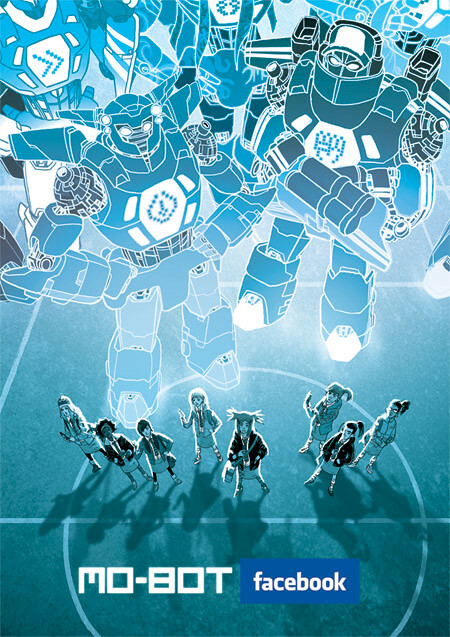 And hey, if the idea of a school filled with plucky kids having adventures with cool magic giant robots appeals... well. Do I really need to spell it out? More Mo-Bot Week* Fun-ness tomorrow! *Yeah, yeah, so Mo-Bot Week kind of morphed into Mo-bot Fortnight - my son got chickenpox so schedules have taken a bit of a tumble all round. He's on the mend now, hooray! Ace comics reviewer for the Forbidden Planet International Blog Molly Bruton recently had a bit of a disagreement with a trampoline and by all accounts busted up her arm pretty good. 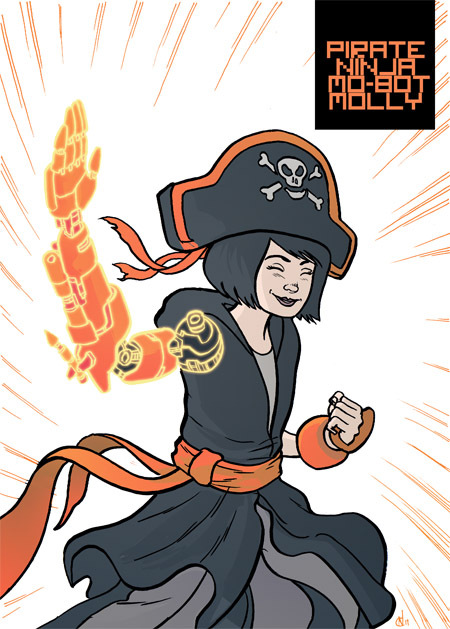 Anyway, fine comics artist Adam Cadwell decided to #drawmolly to cheer her up, with this marvellous picture. And that seemed like such a good idea that I thought I'd join in, too. Molly - and her Dad, Rchard - wrote some very nice words about Mo-Bot High back when it came out. I don't mean to set a precedent here, that I'll draw a picture for anyone who gives my comics a good review and then injures themselves in a trampolining accident. Actually, you know what? I think I am okay with setting that precedent. Anyway, we discovered very quickly at the launch that they were not in fact going to be used so much for 'display purposes' as for 'my son playing with and having fights with and generally bashing into things' purposes. 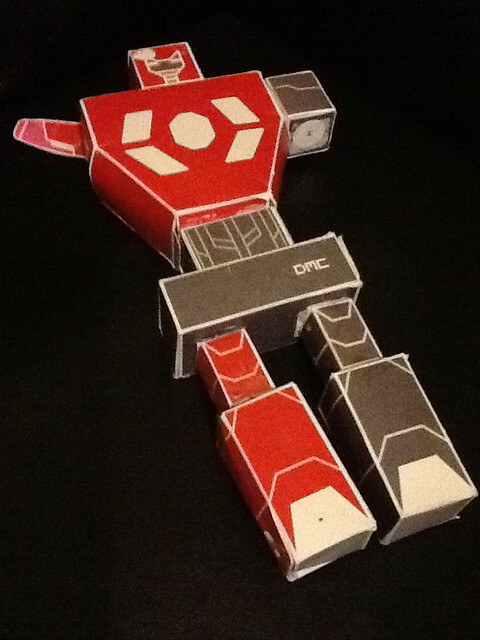 I was not about to object, because- well, because frankly there is not much in this world more heartwarming than watching one's son enthusiastically recreating scenes from one's own book with a homemade toy cardboard giant robot. Clearly, it was time for some repairs. 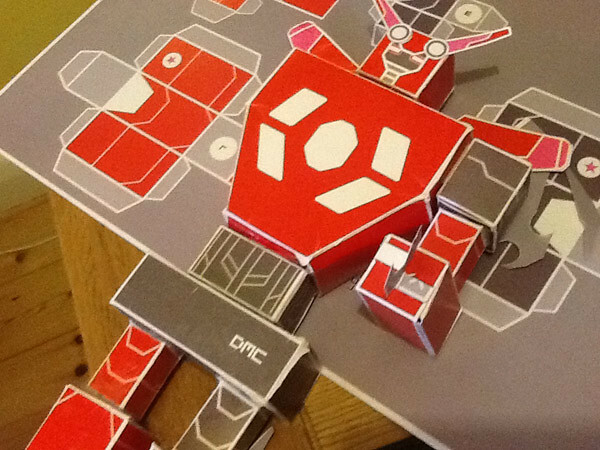 I actually had one cardbot kit spare from doing some school events, so we decided this morning to cannibalise it for parts. And before you knew it, Red Mo-Bot was as good as new, and ready to hang out with his best friend, "Other Red Mo-Bot". 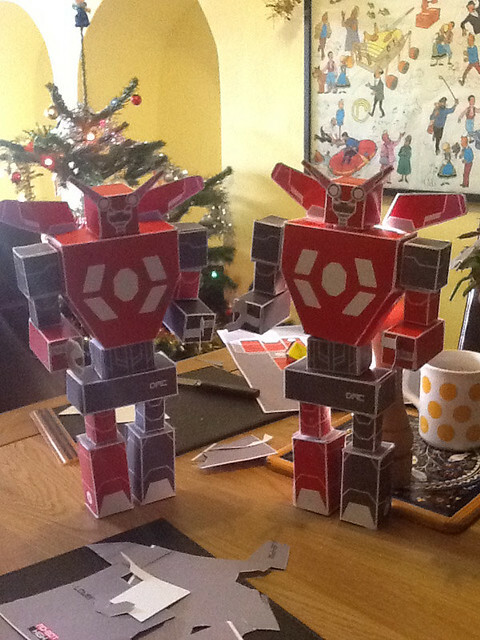 It's funny to be doing this a year on; inadvertantly, getting scissors and glue out and making cardboard mo-bots seems to have become as much a part of my pre-christmas preparations as putting up the tree and re-watching Lord of the Rings for the bazillionth time. 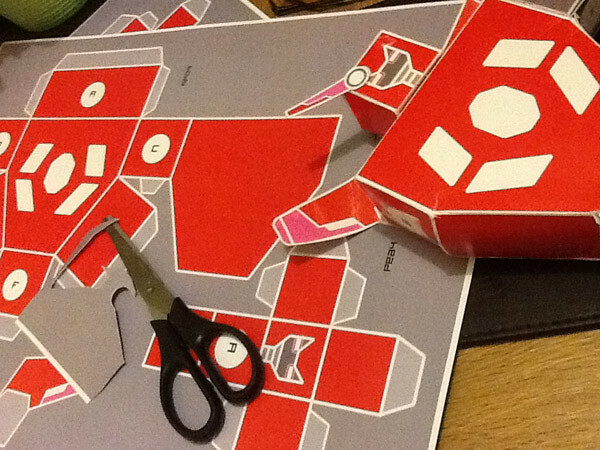 Anyway, it was lots of fun and if you would like to build - or indeed repair - your OWN cardboard giant robot, handy kits to download and print off are available for the very reasonable price of FREE over on the Mo-Bot High website! And you can check out more pictures over on the (still brand new) Facebook page! Judge Mo-Bot! You want a bigger version? HERE is your bigger version. Here is today's drawing for Mo-Bot Blog Week! Enjoy! The SECRET ORIGIN of today's drawing: I was at the 2D festival in Derry, and I remember a couple of fine comics artists - Rufus Dayglo and Rob Davis, if memory serves - saying that they'd never really found "their" Judge Dredds; that whenever they tried drawing him, Mike McMahon's version came out, so profound was the influence of that great artist and his defining work on that character. Anyway, that resonated with me. I've tried drawing Judge Dredd a couple times but it's never really worked - largely, I think, because I've never found "my" version either. (Not due to McMahon-influence in my case; much as I love that guy's work, I was always more of a Bolland kid. Make of that what you will). So I started thinking: what would my Judge Dredd look like? 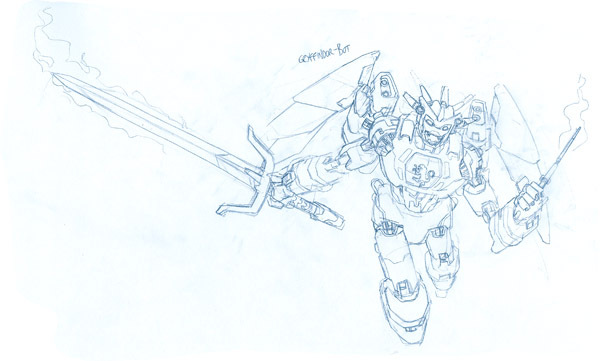 Well, obviously he'd be a massive neon giant robot. I can't believe I didn't see it right away. More Mo-Botiness tomorrow! Follow along here or go like the brand new Mo-Bot High Facebook Page for more fun stuff! (2)) stupid nonsense for my blog when I ought to be doing real work instead. 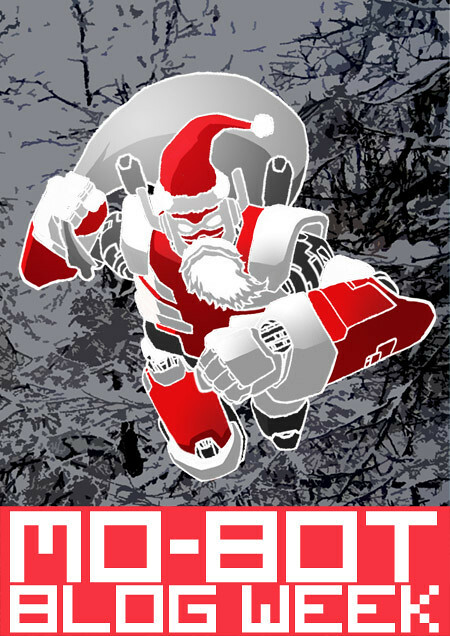 Anyway, as a bit of an early Christmas present to myself, I'm going to spend this week making up for it with Mo-Bot Blog Week, where I shall be posting all sorts of fun drawings and bits and bobs with a Digital Mobile Combatsuit-y flavour! Do stay tuned - hopefully there'll be at least one cool thing a day, and if I manage to get it all done, the thing I'm hoping to post for Friday should be a bit special. 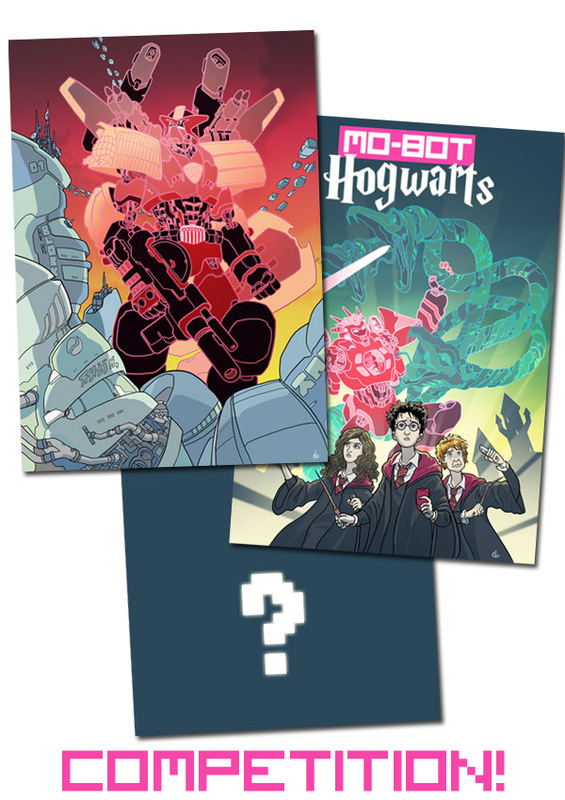 While I'm here: question I've been asked a lot lately is "when's Mo-Bot High Book 2 coming out?" and, while I am unable to give you a concrete answer to that question (it's complicated, and I have rather a lot of pirates and dinosaurs to draw first), I thought I'd offer a list of things YOU can do to help it happen as soon as possible. Undertaking any one of these actions will qualify you for entry in Team Mo-Bot, and earn my eternal undying fondness. 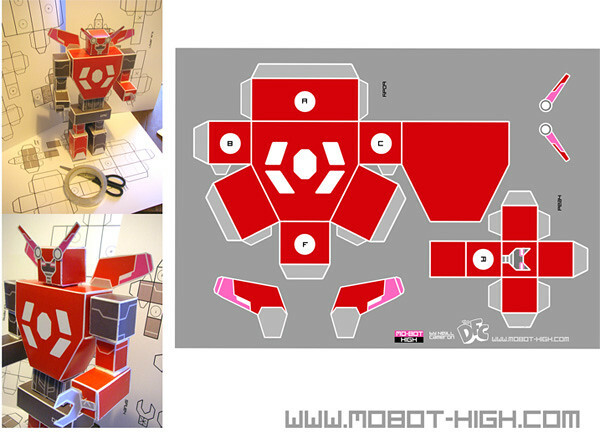 Go 'Like' the new Mo-Bot High page on Facebook! Just set this up; I'll be posting all sorts of stuff here, and thought it'd be a good place to try out some fun ideas I have for the future - go along and Like the heck out of it now to get on board early! Write a review on Amazon! I mean, assuming you liked the book. If you hated it: well, it's a free world I suppose, buddy. Tell your friends! Your actual real-life friends. Hey, you could even give them a copy for Christmas, right? Develop the technology to actually create real digital giant robots that launch out of mobile phones, and then lead an army of them marching through central London, waving 'Mo-Bot High' banners. Extra points if you manage that last one! 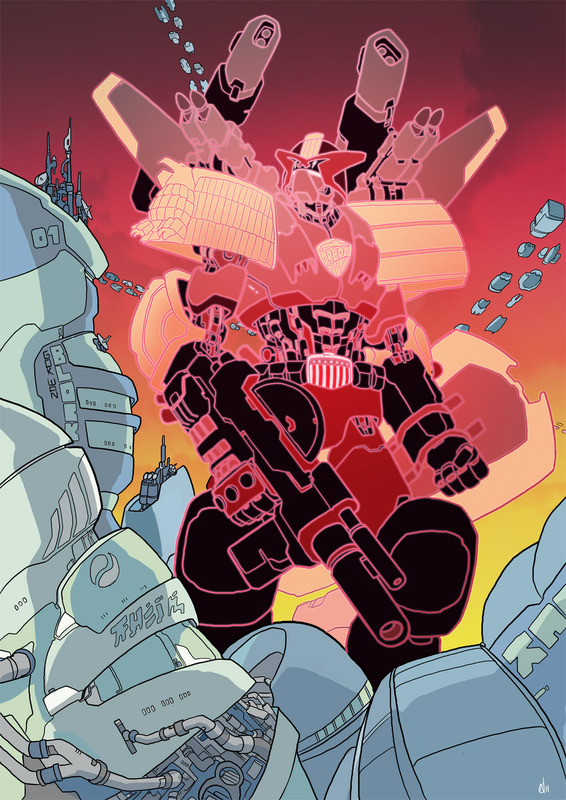 Anyway, check back tomorrow for our first bit of Fun Stupid Giant Robot Nonsense! Many people, myself included, find this a very difficult time of year, as we are supposed to not only PART WITH MONEY to buy things for our "loved ones", we are expected to actually "think" about what they might "like". Exhausting. Anyway, I am here to help any other lost souls stuck in this terrible predicament by offering the following suggestions for AWESOME THINGS that would make EXCELLENT CHRISTMAS PRESENTS! The big one, the greatest, the gift that keeps on giving. 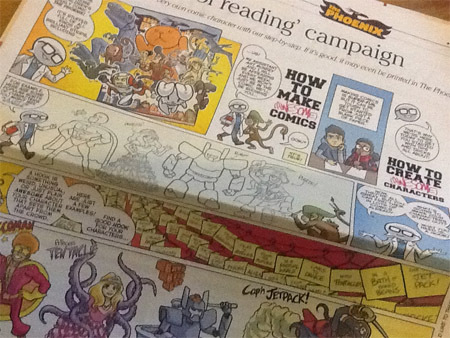 Head over to the Phoenix site to check out subscriptions ranging from a £10 'taster' to a full year's worth of issues - £99 for a years' worth of fantastic comics! 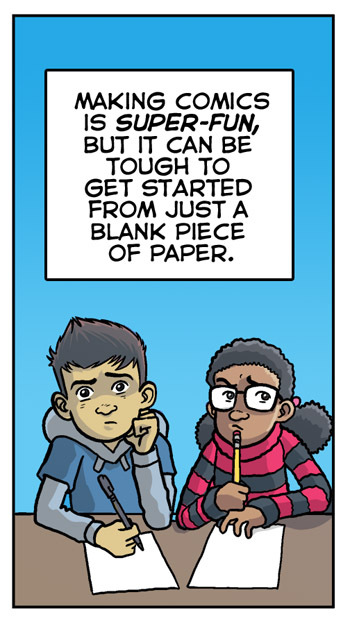 And hey, every week you'll be getting a double-dose of my own work, with weekly instalments of The Pirates of Pangaea and How To Make (Awesome) Comics! If you happen to like that sort of thing. So maybe you want something to actually open and read on Christmas morning? Why not buy this rather excellent graphic novel - "a fantastic, uncontrollable riot of a story, absolutely brilliant fun", in fact*. Pick it up for a snip on Amazon, or better ask your local bookshop or comics shop. Or you can always get a copy direct from the author who might even draw a nice little picture in it for you. * review by Richard Bruton, Forbidden Planet. 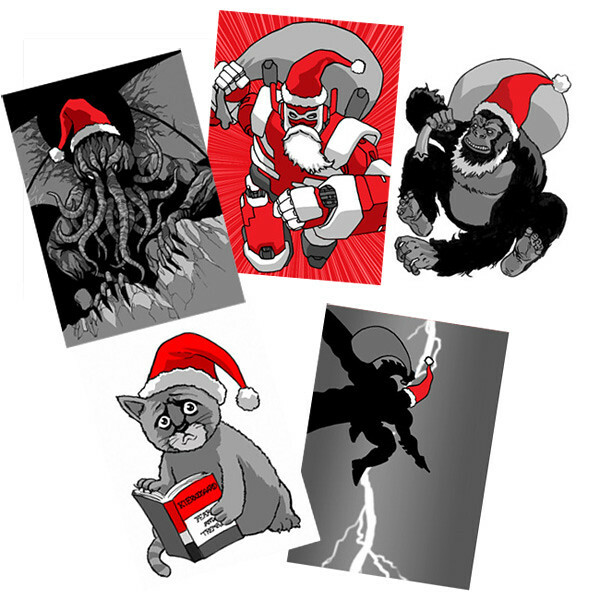 Okay, you'd better be quick, but there's still just about time to order a few of these delightful, if nerdy, Christmas Cards of Awesomeness! 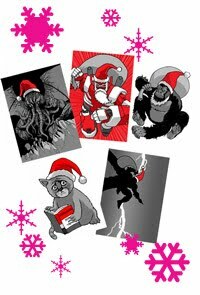 Perfect for the Giant Robot / Gorilla / Batman / Cthulhu / Kierkegaard / Kitten fan in your life. Look, I have Christmas presents to buy too, so while I probably shouldn't, I'm opening up a couple of slots for commissions. 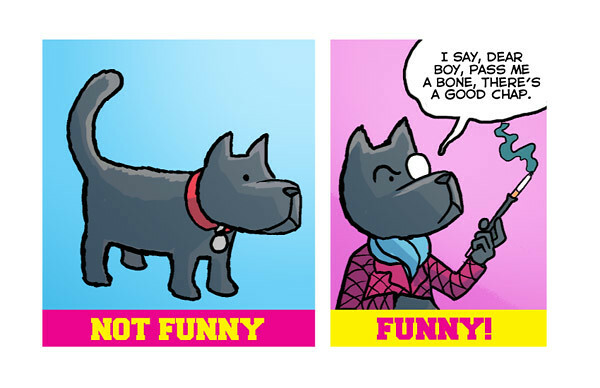 Say perhaps you, or someone you know, enjoyed my A-Z of Awesomeness series, and would like your very own bit of original art of your favourite comics character doing something ridiculous. Well sir / madam, I can make that happen for you. This week only, and they'll be drawn and posted by the weekend, so get in quick! 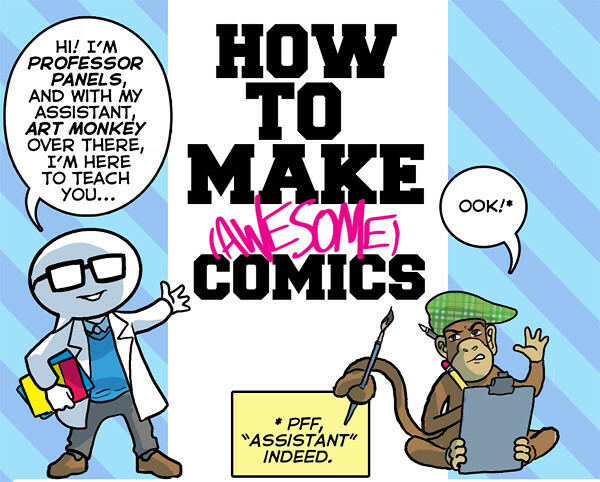 How To Make (Awesome) Comics: The Comic! The good professor here and his associate are the stars of my *other* new strip that will be appearing weekly in The Phoenix - How To Make (Awesome) Comics! 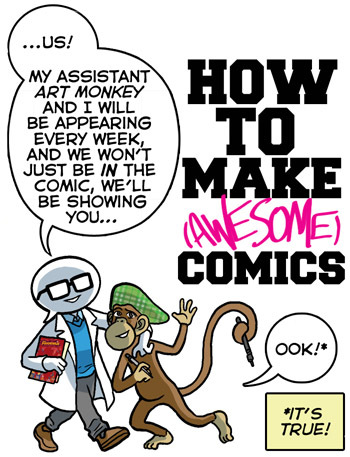 Every week's strip will feature a little lesson from the Prof about some aspect of the writing or drawing or how-comics-work type hoo-hah, followed by a Monkey Masterclass giving the readers the chance to dive in and get involved with all sorts of fun comics-making games and exercises. The general idea is something that's part Scott McCloud, part Robert McKee, and part "lots of stupid jokes about farting and bananas". It's a little hard to explain in the abstract, but honestly - I'm a good few strips in now, and I'm enjoying this as much as anything I've ever worked on. It's really fun as well, because I get to try out ideas and jokes and stuff when I'm out on the road doing workshops, and then feed them back into the strip, which is rather nice. As a cartoonist there's something rather lovely about being able to try out new material in front of a live audience, and actually *know* what gets a big laugh. 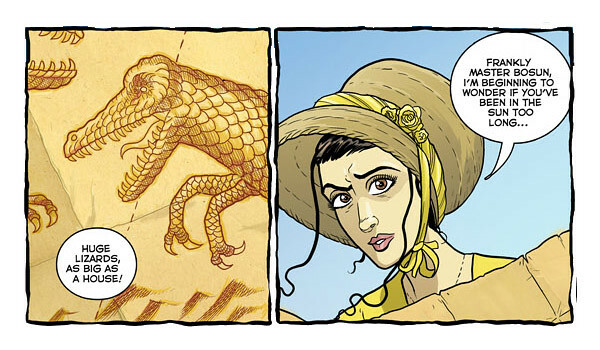 Pirates of Pangaea - issue Zero Sneak Peek! 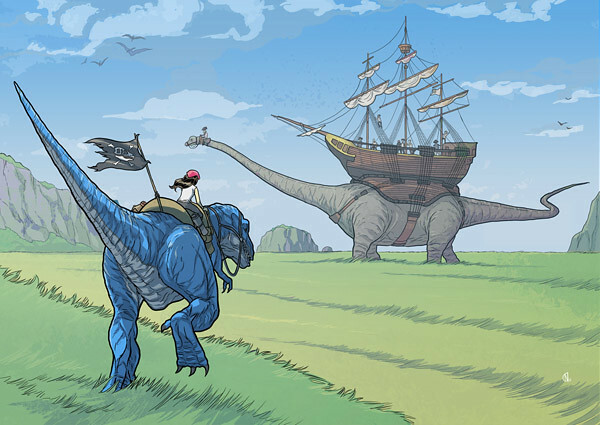 The Pirates of Pangaea ©2011 Daniel Hartwell & Neill Cameron. Check out more info on the Phoenix website, and a larger version here! Hey, have you been over to the Phoenix website to grab your copy of Issue Zero of the super-exciting new weekly comic yet? There's lots of cool stuff in it, including a 4-page prologue to The Pirates of Pangaea, me n' Dan's new strip, from which I present an exclusive preview HERE! ..or HAS he? Go grab a copy of Issue Zero to find out! Well there I was shopping for organic hand-picked artisan Green tea and what did I see by the till? 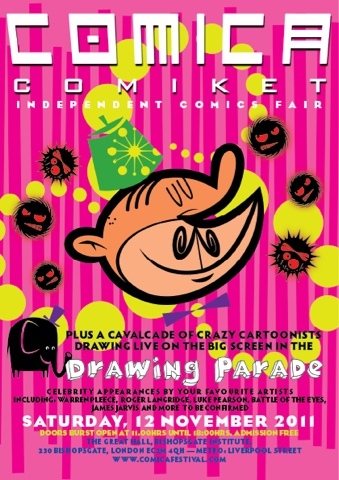 Why, only the Future of British Comics, that's all. grab a copy of Waitrose Weekend magazine. It contains a CODE. If you don't live near a Waitrose, don't worry - plans are afoot to make sure no-one misses out on their Phoenixy goodness. And look, if you know anyone who *does* live near one, or if you have access to the Internet and a bit of initiative, I dare say you'll be able to get ahold of the code. But if you can, you really should try and grab hold of a copy of the mag, as it's got a great-looking pullout section about the Phoenix, a glorious double page spread by Patrice Aggs, as well as such esoteric delights as Today presenter James Naughtie talking about comics, and the revelation that Olly Smith off Saturday Kitchen used to write for Pingu. I'm so excited about Issue Zero - I was lucky enough to get a peek at a copy the other day and it really is something a bit special. It's not just recycled content or the first few pages of stuff that was going to appear anyway ("preprints", I guess), as you'd often get in these kind of things - we all went to a lot of effort to create new stuff specially for the occasion - prologues, teasers and standalone episodes, as well as some other very exciting bonus treats. I'll try and blog more tomorrow with a sneak peek at my contribution(s) to the issue, but till then- seriously, go and grab a copy, while stocks last. Order one on behalf of a son/ daughter/ niece/ nephew/ class/ local neighbourhood street gang of your acquaintance, and be the gnarliest* grown-up on the block. Or heck, just order one for YOU. And then read it while you sip your organic artisan hand-picked green tea. *What, you didn't hear? 'Gnarly' is totally back. 1.30-2pm: Sarah McIntyre: the fabulous creator of Vern & Lettuce and illustrator of Morris The Mankiest Monster and many more! 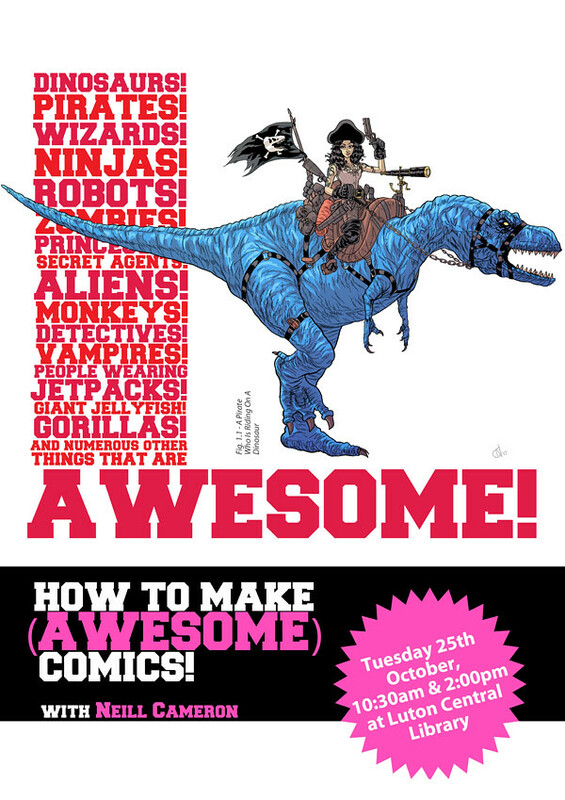 Sarah will be signing and sketching and comics-jamming and well frankly WHO KNOWS what comics-related mayhem may ensue. 2.30-3pm: Adam Brockbank: the preposterously talented comic artist and film concept art designer extraodinaire (Harry Potter, Captain America, and those are just the ones he's casually, off-handedly mentioned, doubtless many more) will be signing copies of the extraordinary MeZolith. 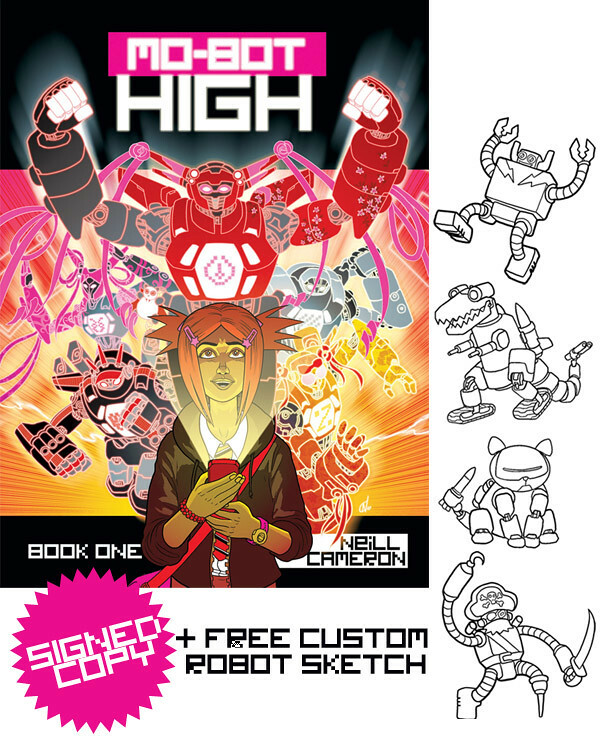 3.30-4pm: Neill Cameron - that's me - will be signing & sketching copies of Mo-Bot High, drawing robots on any available surface, and... well, who knows? I'm going to bring my trusty cardboard mo-bot along and take pictures of him meeting various Interesting People, I think. And Hipsters.Hipsters and cardboard robots, it should be a fun afternoon! Anyway, I'm not actually too sure what else is happening on the day - as previously discussed, I currently have an embarrassingly limited brain capacity for any matters not directly relating to Pirates and Dinosaurs - but I know there's going to be loads of amazing cartoonists drawing live on a big screen and stuff, so I'm pretty excited to be going along. I'm mostly just hoping to meet and hang out with some interesting comics people, and maybe snag a copy of Blank Slate Books' utterly great-sounding Nelson, which I think is out now? I think? Anyway, do come along and say hi. And on that note, I hear the call of Pirates and Dinsoaurs. Till Saturday! The GIGANTOSAURUS Sale is on! ...Neill's Christmas Cards of Awesomeness! 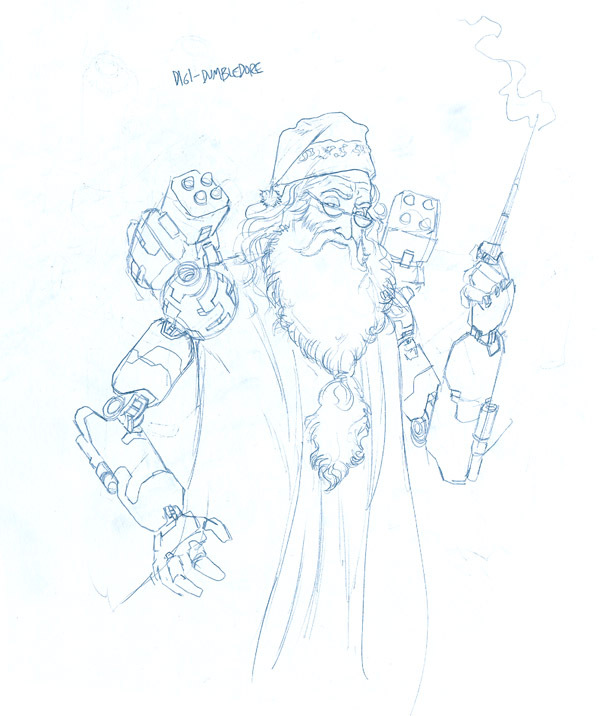 Five designs, featuring Father Christmas mish-mashed with everything from Cthulhu to Batman to (naturally) Giant Robots. 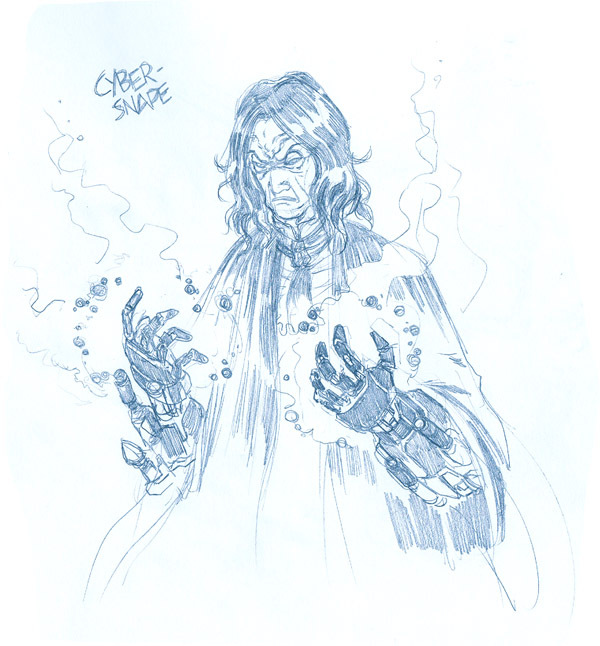 Commissions are currently SOLD OUT due to workload pressures, but I might put a couple of pieces of original art up in the shop in the next couple weeks, so keep your eyes peeled for that. Now: please go and buy things so that I can move in my studio and afford to buy Christmas presents and stuff! Thank you. COMPETITION! Design A Fantastic Creature! And Win Fabulous Prizes! 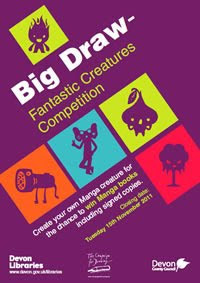 Those fine people over at Devon Libraries are having a competition as part of The Big Draw in October to design fantastic, weird and wonderful creatures! The most fantastic, weird and wonderful will win prizes! There's some signed copies of Mo-Bot High in it for the lucky winners, for starters! And I will be helping to judge the entries. I promise to be fair, impartial, and completely immune to bribery. Unless anyone has any peanut butter m&m's. You DIDN'T HEAR ME SAY THAT. Full info over on the Devon Libraries site! And in case you were wondering about the singularly weird and wonderful creature at the top of this post, she/he (?) is the result of a game-of-consequences-type collaboration between myself and the ludicrously talented and famous cartoonists Sarah McIntyre (head) and Garen Ewing (body). I drew the feet. Looking at it now, I think maybe we each modelled our sections after ourselves. Appropriated / recycled from the Super Comics Adventure Squad blog, lo these many years ago. 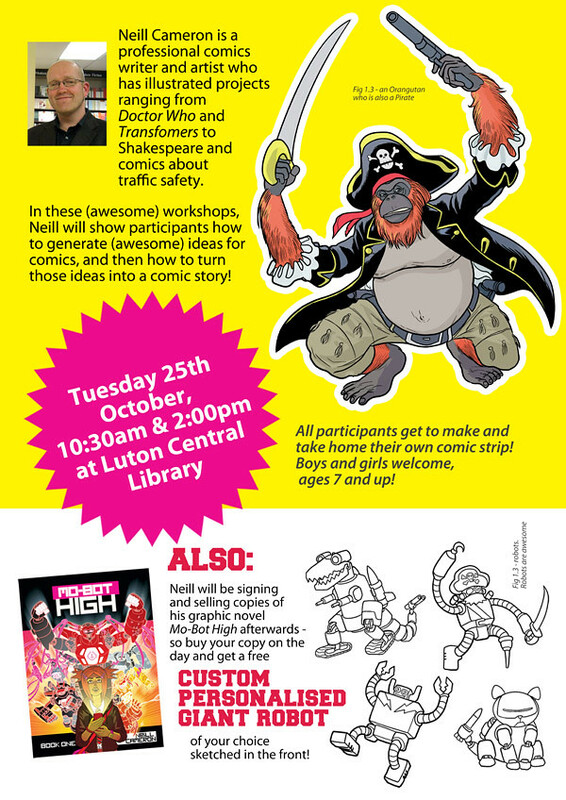 Tues 25th October: Luton Central Library - How To Make (Awesome) Comics Workshops - sessions at 10:30am and 2:00pm! Details here! Friday 28th October: Haverfordwest Library, 10:30am - one-hour illustrated talk and live interactive drawing shenanigans! If you're in the area, or know anyone with kids who might fancy diverting them for an hour or two with robots and monsters and kung-fu zebras and such, do let them know! 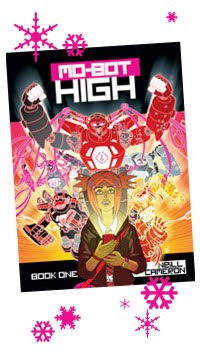 I will of course be selling and signing copies of Mo-Bot High at all events! Other than THAT - look, I know I've been nigh-invisible in terms of blogging and tweeting and facebooking and g+ing and such lately - god, I'm exhausted just listing it all. This invisibility has extended to going along to comics conventions and events etc. What can I say, it's always the case as a freelancer that when one is the busiest, that's when one can kind of disappear from the face of the earth a bit. Just last week I was really sorry to miss the launch party in London for the Etherington Bros' Baggage, the brand new release from the DFC Library that looks absolutely fantastic and is just about the most exciting and positive thing one could hope for in British comics. Anyway, m'colleague Sarah McIntyre went and wrote a great report of the night on her blog, so go read that! Essentially, I'm just flat-out, nose-to-the-wacom on all manner of exciting, awesome, fantastically superlicious stuff for The Phoenix, and between that and, y'know, parenting, that's pretty much all 28 hours in the day accounted for. But hey, it's not long now till January 7, 2012, when you'll get to see all the fruits of this uncommunicative busy-ness for yourself! PS Not really "till then". I will totally be blogging between now and then.